After emerging as the single largest party but failing to secure a simple majority in the Kalyan-Dombivali Municipal Corporation elections, Shiv Sena on Monday started negotiations with Raj Thackeray-led Maharashtra Navnirman Sena, a party source said in Mumbai. On the other hand the Bharatiya Janata Party too was trying win over independents for coming to power, sources said. The Sena won 52 out of the total 120 seats, BJP 42, and MNS 9. A senior Shiv Sena leader said the party leader Anil Parab met the MNS leader Nitin Sardesai in Mumbai this evening to discuss power-sharing. Parab refused to comment when contacted. Senior Sena leader and industries minister Subhash Desai said the party will not need MNS's support. 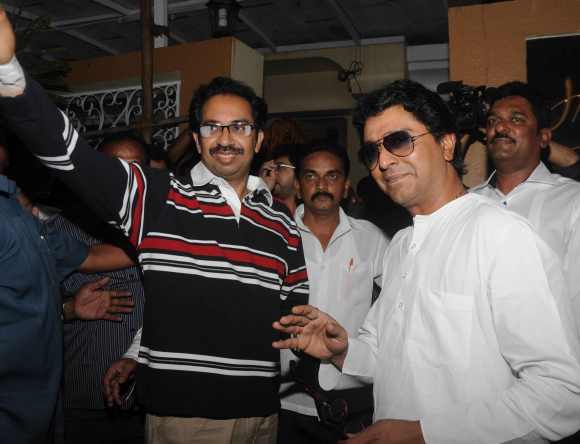 "Mayor will be of Shiv Sena and we will not need MNS's support," Desai told PTI. A BJP leader said the KDMC results had given the party the confidence to contest the Mumbai civic elections of 2017 independently (without alliance with Shiv Sena). BJP MP Kapil Patil denied that his party criticised Shiv Sena, the ruling alliance partner, during the campaign. "We just responded to Shiv Sena's criticism. We are open to options to come to power," he said. A state BJP leader said that BJP and Sena -- which hit out at each other freely during the campaign -- would again join hands in the KDMC and share the Mayor's post for two and a half years each. When asked whether BJP plans to contest Mumbai civic elections separately, he said, "We are two separate parties and we have the right to increase our base. If we contest separately, we have the opportunity to contest in all the 227 seats. In fact, the unexpected result at KDMC has boosted the morale of party workers that will help us in Mumbai corporation elections."